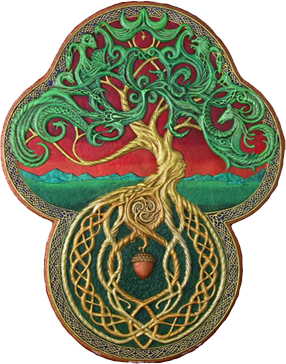 The "Bile Rath" (or "Bile Ratha") is the legendary Tree of Life, or Sacred tree in Celtic Mythology. From a more practical point of view, the large forests of Ancient Ireland were often victims of warfare, burned to the ground as a part of seiges. Often , the one or two trees remaining after such a conflagration were considered sacred from that time forward. This is an original short story, written by me in honor of World Storytelling Day 2012, whose theme was "Trees." It has the lore of the Bale Rath, interwoven with bit of my own family history, and themes of death and rebirth that have been much on my mind these days. Interested in other short stories I have written? Click Here and enjoy a few of them.